Author: Scrivener, Leslie Set In . . .
On April 12, 1980, Terry Fox set out from St. John’s, Newfoundland to begin the run across Canada that he named the Marathon of Hope. His ambition was to raise a million dollars for cancer research. It wasn’t easy. Initial support from communities varied from terrific to nothing at all. His prosthetic leg was painful to run on, and there were always traffic and extreme weather conditions to deal with. But, by the time he reached Ontario – a journey of more than 3,000 kilometres – word of his achievement had spread, and thousands cheered him and followed his progress. Terry’s spirits soared, and now he hoped to raise $22 million dollars – one dollar for every Canadian. He succeeded in this ambition, but the Marathon of Hope ended near Thunder Bay, Ontario on September 1, 1980. The cancer had spread to his lungs, and, after running 24 miles in one day, on the next he could run no further. 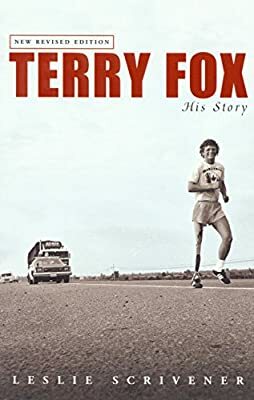 When cancer finally claimed his life in 1981, Canada mourned the loss of a hero, but the Terry Fox Marathon of Hope lives on. The Terry Fox Foundation raised more than $17 million in 1999, and support for the event nationally and around the world is growing.